When we think of libraries, we tend to think of classical buildings with high ceilings, beautiful arches and rows of tall shelves lined with books. 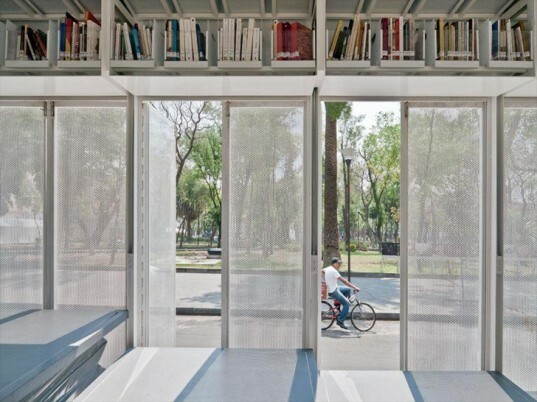 A47, a mobile library designed by Productora in Mexico is a contemporary reinterpretation of the reading room, thus offering a refreshing modernist take on an old concept. An initiative by Fundación Alumnos47, the idea behind this project is as modern as it looks: to use the space for workshops, book discussions, presentations and lectures, making it much more socially interactive than just a mobile library. The doors are semi-perforated sheets that give the vehicle a certain level of transparency, creating a seamless interaction with the people outside. The design of the bookshelves is the most unconventional part of the project. Unlike typical libraries, books are placed in transparent floating shelves at the top on all four sides. Interesting as it looks, it does seem a bit contrary to the approach of creating an inviting interface as the users will not be able to browse through or select the books. The spacious and open platform to hold a number of events related to literature, culture and arts is definitely an innovative addition to A47. This mobile library has versatile floor that can be set at different levels to create a stage for readers, for example. The vehicle is also illuminated at night, with light being produced by the lorry’s own integrated electricity generator. The doors are semi perforated sheets which gives it a certain level of transparency hence making it creating a seamless interaction with the people outside. The design of the bookshelves is the most unconventional part of this project. Unlike typical libraries, books are placed in transparent floating shelves at the top on all four sides. Interesting as it looks, it does seem a bit contrary to the approach of creating an inviting interface as the users will not be able to browse through or select the books. Spacious and open platform to hold a number of events related to literature, culture and arts is definitely an innovative addition to A47. 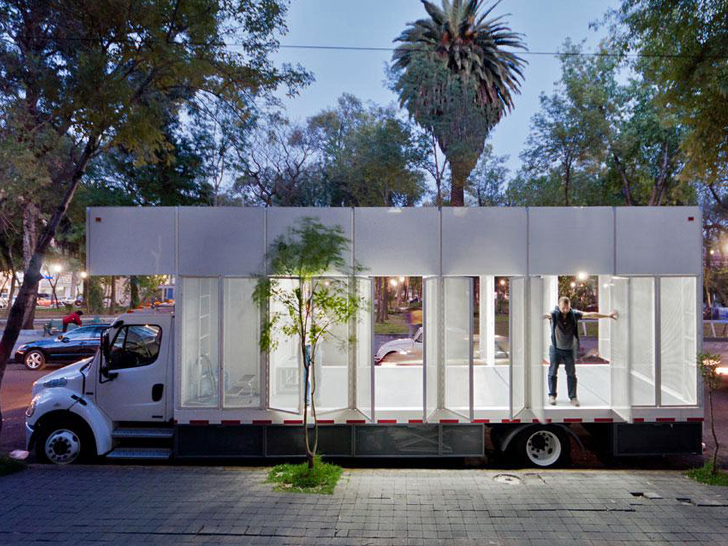 A Cultural Centre within a 20 square m space on board a Freightliner M2 20K lorry. Parts of the platform can even rise up to a stage whenever required for the events. The versatile floor can be used at different levels to highlight the presenters at the time of the events. The illumination is produced by the lorry's own integrated electricity generator, keeping its spirit alive even in the darkness.